Timmer’s emotional debut about saying goodbye should come with a box of tissues. 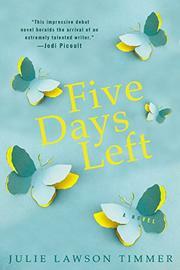 Scott Coffman has five days until the little boy he’s been caring for returns to his birth mother; Mara Nichols is five days away from killing herself before Huntington’s disease can steal her independence. The two meet anonymously in an online therapy forum, and although their paths never cross in real life, Timmer deftly compares their shared dilemmas of when and how to let go. Mara’s husband dotes on her, while her parents, colleagues and the friends her daughter adorably calls “those ladies” are unwavering in their support. It’s only through the harsher lens of the outside world that we see the devastating effects of Mara’s disease, from the awkward gait that makes her look drunk to the kids at her daughter’s school to the woman who tries too hard to help after seeing Mara soil herself in the grocery aisle. As the countdown continues, seemingly normal moments carry more weight than Mara can bear; at one point, she compares the sound of a dial tone to the “one-note dirge” of a flat-lining EKG machine. Scott can relate. He’s trying to cram in as many bedtime stories and home-cooked meals as he can before sending Curtis back to his junkie mother, who often let the boy go hungry. But Scott’s pregnant wife, Laurie, fears Curtis’ behavioral problems might be more than their family can handle long-term. Scott’s dread at sending Curtis home is almost as hard to digest as the uncomfortable truth that Laurie may have a point. Is it selfish for Scott to put the boy’s needs before his wife’s? Is it more selfish for Mara to abandon her family now than to ask them to care for her in the final stages of her disease? As Scott and Mara wrestle with ethical questions, the answers they find are both relatable and debatable. The characters are so affecting it’s tough to make it to Day 5. An authentic and powerful story.